I have to say out of the three books released by Gecko Press this one is my favourite, simply because the illustrations are so stunningly beautiful. Komako Sakai uses a palette knife on board, with layering of simple opaque, pastel colours contrasted with charcoal greys and sparse Matisse-like black outlining, but the most stunning thing of all is the rendering of cats and kittens. This artist has an amazing ability to, with a few strokes, show the angular lines of a cat’s body as well as the softness of fur. Her mother gently shows her how to care for the kitten, cleaning it with a soft wet towel, wiping the goo out from its eyes. Hina softens towards the creature and is drawn into the spell of wonder at its tiny life. 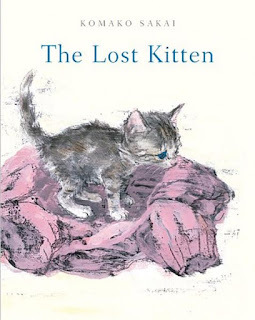 As Hina learns to understand the kitten and its instinctive ways such as lapping up milk with its tongue and hiding under cupboards she also learns how to care for it, providing a bed and a collar with a bell and thinking up names for it. But as her mum leaves the house to go and get food for the kitten Hina realises it has disappeared and she panics. It reminds her of a time when she was lost while shopping with her mother. 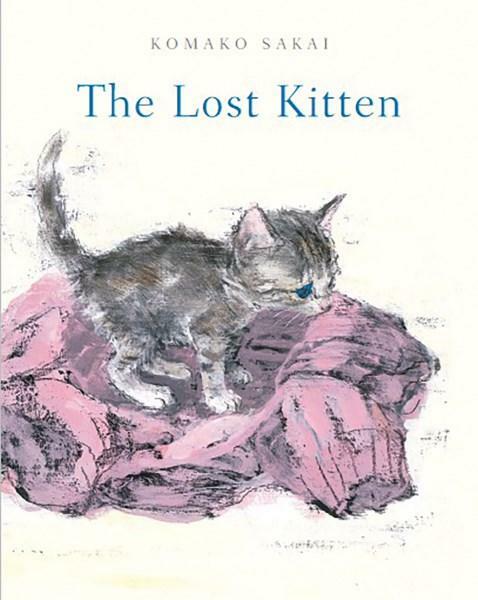 The fear she felt on that day she now ascribes to how the kitten must feel, for she is sure that it is lost too. Hina searches for the kitten and promises to be its friend. She persists, realising how much it means to her. As she puts on her coat to go searching outside she finds it at the bottom of the cupboard curled up with a sweater. The cat is thus named Sleepy and so begins the friendship. The gentleness of the story, translated beautifully from Japanese, is very touching. Somehow the artist manages to convey the harshness of life as a wildcat with the softness of the kitten’s fur and the progressive softening of Hina’s heart. It’s a beautiful book and in hardcover edition is a comforting heirloom. Suitable for ages 2 to 5 years.